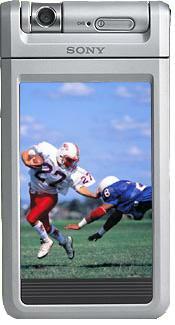 The first 66MHz Palm OS device. The first Palm OS device with virtual graffiti technology and a physical keyboard. The first Palm OS device with a resolution higher then 320 x 320. 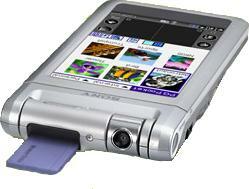 16mb of memory, 16-bit color, memory stick technology, and even an optional embedded camera. 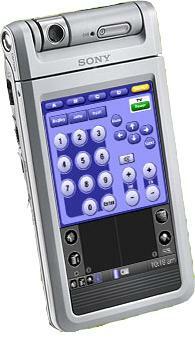 Sony's CLIE NR-70V does it again, surpassing all its Palm OS competitors in basically every way. When you think Sony, think advancing PDA technology. The NR-70V combines power and usability into a different style product. Unlike other similar products the NR-70V is the first Palm OS based device to come in a clamshell form with a built in keyboard. This means the user gets more options for inputting data into their device as well as more options for how do something as simple as hold your device. Though neither of these options provide to with more revolutionary technology, simple refinements like this can add to your mobile experience. What about the technical side? What does the faster processor and higher resolution really get you? Better performance. In a day of more complex applications that are taxing on not only your memory but your processor, a faster processor will help your device run better, providing a better experience for its user. With desktop computers reaching over 2000MHz,laptops over 1000MHz, and most Palm OS products only running at 33MHz, twice the power is rather helpful. The higher resolution screen gives you better image quality then almost any device on the market. Instead of the standard Palm 160x160 resolution or the Pocket PC's 240x320, Sony has gone even further beyond its standard 320x320 resolution with a 320x480 pixel screen. For optimized applications, the Sony will provide you with a better quality.